We all know that investors shouldn’t buy high, but where does that leave investors in cannabis? In honour of the first legal 4/20 celebration in Canada, we’re exploring which pot stocks will create the cleanest hit for sustainable investors. Before we get started, I need to communicate that cannabis stocks are much riskier investments than the typical big companies we look at in this column. A high Beta suggests heavy volatility, so only invest if you’re ready to put on a safety belt and go along for an intense ride. Canada-based Canopy Growth (WEED:TSX) is the largest cannabis company on the stock market today. I first heard about Canopy in 2014 when they purchased the abandoned Hershey’s chocolate factory in Smiths Falls, Ontario and turned it into a massive greenhouse for growing medicinal cannabis. Their share price was hovering around $2 at that time, and what a ride it’s been for investors with the share price reaching a high of $67.74 in October last year just before legalization in Canada. On April 15, it opened at $55.74. With popular brands like Tokyo Smoke and Tweed, Canopy is well-positioned to blaze a trail in the now-legal recreational market. Alcohol maker Constellation Brands, which we profiled in our St. Patrick’s Day showdown, recently made a US$4 billion investment in Canopy. But how sustainable is Canopy? Not very, according to this report from sustainable investment research firm Sustainalytics. Canopy scored poorly on several measures, including energy intensity and the use of pesticides. 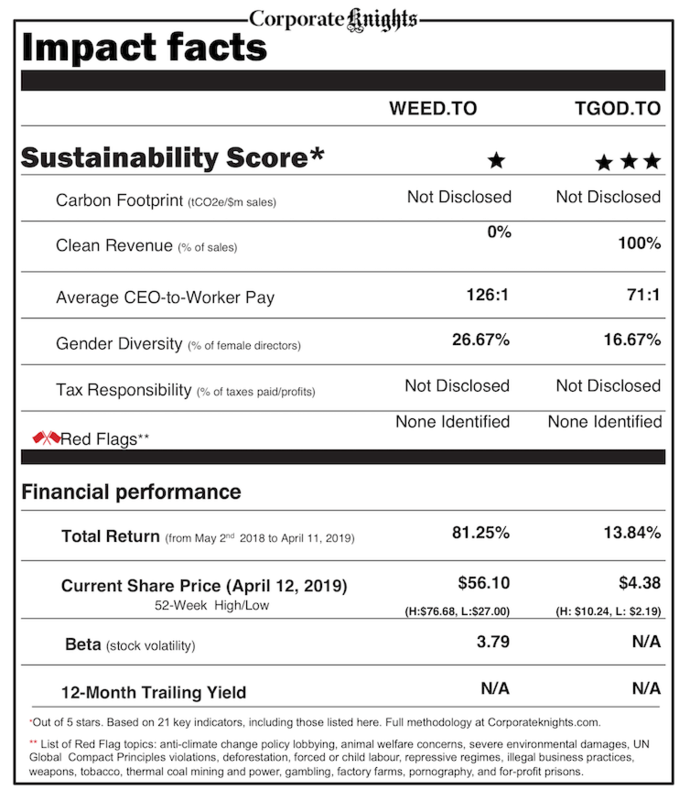 Canopy does not publish an annual sustainability report, so lots of important data goes unreported. A quick look at their Corporate Social Responsibility webpage shows a focus on educational partnerships with groups like Mothers Against Drunk Driving (MADD) and the Canadian AIDS Society, which is laudable. However, the only environmental initiative I found was a partnership with TerraCycle to develop recyclable packaging. 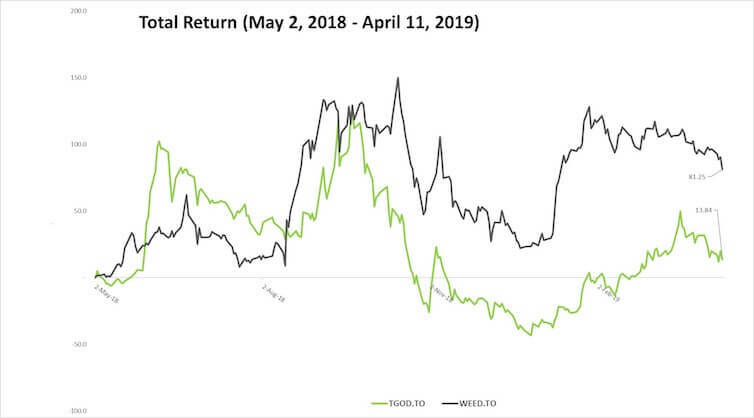 With a lot of question marks around energy/water consumption and a lack of policies that ensure safe growing practices, investors have cause to be paranoid. A much smaller Canadian company, The Green Organic Dutchman (TGOD:TSX) is a medicinal cannabis producer that only grows certified organic product. It, too, has yet to deliver a formal sustainability report to date, but they do publish specific sustainable principles like recyclable packaging (their glass jars should avoid the overpackaging backlash that Ontario Cannabis Store products have faced), and a commitment to efficient technologies like heat transfer and water reuse. Most importantly, all of The Green Organic Dutchman’s farms and greenhouses are certified organic. They’ve just started selling to medicinal customers and have short-term plans to enter the recreational market. Sadly, stoners won’t be able to smoke a legal organic joint from TGOD this weekend. You’ll notice on our scorecard (below) that both companies have pretty high CEO-to-worker pay ratios, but Canopy’s has definitely raised eyebrows. Canopy’s CEO, Bruce Linton, collected over $6 million in total compensation in 2017, equivalent to 15% of the company’s $40 million revenue that year. 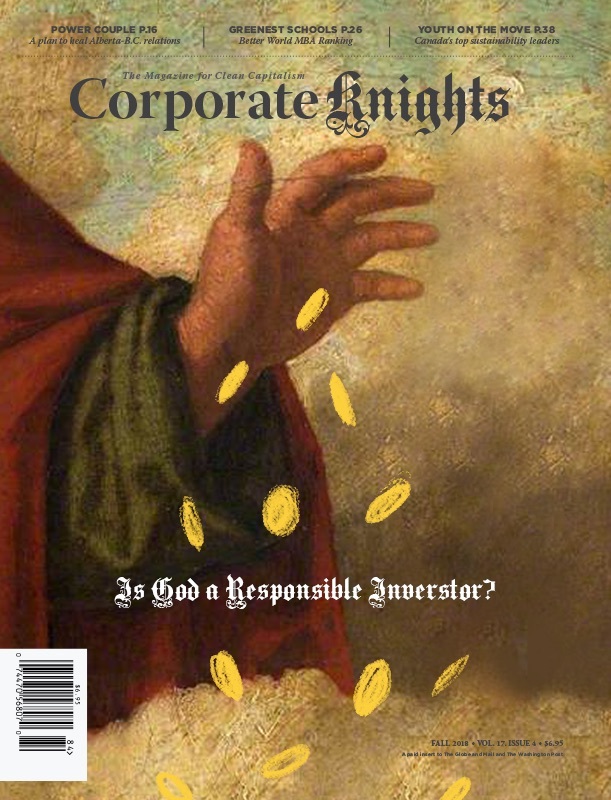 Love that TGOD’s CEO pay was only $1 in 2018, but some will argue that the $2.5 million in shares he earned as a bonus that year tipped the scales, considering the company had yet to earn any revenue or launch their IPO. In contrast, the median total compensation of 101 other high-growth companies at IPO stage (including LinkedIn, Yelp and Google) was US $564,000 (C$750,000), according to Crunchbase. There’s no doubt that The Green Organic Dutchman wins this week’s Sustainable Stock Showdown, but a big question remains. Will cannabis consumers live up to their tree-hugging stereotype? If so, then I expect the organic certification to be valuable as consumers should be willing to pay more for The Green Organic Dutchman’s product. That said, the legal cannabis market is still young and it’s impossible to predict. If consumers don’t care about their green being truly green (namely certified organic), then we’ll find ourselves in a “race to the bottom,” whereby companies compete to grow the cheapest crop. The race to cut costs is all too common for traditional commodities like wheat and oil. Cannabis is still just a commodity at the end of the day, and, in this scenario, The Green Organic Dutchman will have a much harder time competing. Tim Nash blogs as The Sustainable Economist and is the founder of Good Investing. Tweet him at @timenash. Investing comes with risk. This article is a general discussion of the merits and risks associated with these stocks, not a specific recommendation. Speak to an investment professional and make sure your portfolio is diversified. Tim Nash does not own any shares of the companies mentioned in this article.